So I am going to spend the beginning time with scratch paper and drawing to get them settled to do their final pieces. Below is the material list and directions. Hope you enjoy! 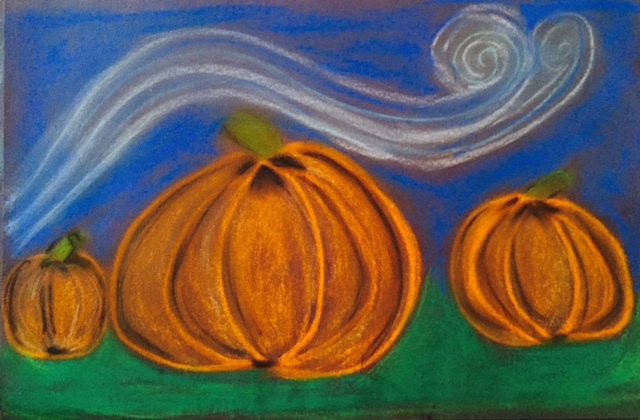 Begin lesson by using links above to show 3 different ways to draw pumpkins. 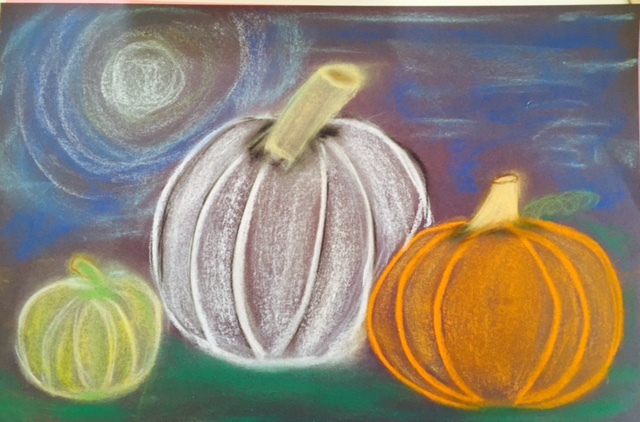 Also show chalk pastel pumpkins by putting that in google search area. So many come up and the colors are beautiful. Also discuss how to use light and dark colors to add depth and dimension to their pieces. You can also bring in small baby pumpkins for tables to use for drawing. Then let students know that they need to have at lease three pumpkins in their drawings by using one or all of the techniques you explored at the beginning of class. I used dark green on the bottom background and dark blue on the night sky. Spray with fixitive or hairspray to seal chalk.